Tis that time of the week we celebrate!!!!!!! Happy Friday dolls!!!!!!! -My umm lady bits & my current saddle (aka seat) don't mix well with City Streets. -I wonder how it would be to ride in heels/wedges. -I live in wedges in summer. -When is summer going to get here? -Winter you are so last season (literally) - GO AWAY...40 degree Highs. BOO. I hope to finish up a bunch of clutches and am planning on having my Etsy shop go 'live' Sun/Mon...stay tuned loves! *Picture has nothing to do with post, I just LOVE it! Super Cute! **UPDATE - Sorry this didn't post on time!...darn AM vs PM! Aww giraffes are my fav. So cute and goofy looking. TGIF! Looking forward to the Etsy shop! We're supposed to have bad weather today and tonight and I'm definitely over that! I love this picture and so agree with you, winter is so so last season. Ready for some serious spring. Happy Weekend! Looking forward to meeting you on Sunday! I love that picture! Have a great weekend lady! Happy Friday!!! I totally know what you mean about getting a padded seat for your bike. Really important. :) Can't wait to see your new etsy shop! Yay Weeeekend!! Wish you were here so we could flea market mania on Sunday. Girl I can't wait for your etsy shop. It's time to bring those original ideas to the forefront and showcase them ALL. Yahoooo!! I live in wedges, as well! Going to Singapore this weekend, woohoo. 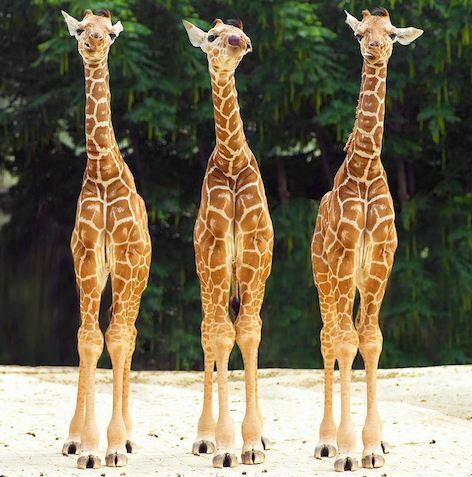 I adore the photo -- giraffes are my favorite! Have a very happy weekend, dear! I wish I had a bike and a bikeable city! Get yourself a new seat and enjoy for me. sooo i just stumbled upon your blog and saw california girl. chicago life. so i decided we have to be new friends :) i am actually an illinois girl. california life!